Today's Featured Fluff Addict is Mama Bennie of 'Randomness of a Cloth Diaper Addict'! 5 months old. Their birthdays are 13 days apart. Both my kids wear cloth at the moment. My husband and I just celebrated our 4th wedding anniversary, and couldn't be happier with our little family. My stash currently consists of 15 KaWaii Baby pockets, 6 KaWaii Baby covers, 1 Wonder Wrap, 1 Organic Caboose Eco Fleece cover and 24 prefolds. I just can't get enough diapers, and I am ALWAYS shopping online for new diapers because they don't sell them in stores where I live. I am mainly addicted to cloth diapers, but I also have an addiction to babywearing too. They kind of go hand in hand. What made you decide to give cloth diapers a try? 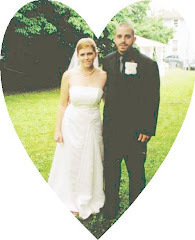 My husband had originally mentioned it when we were pregnant with my first daughter. I originally said no though, because I thought it was still the icky diapers with the plastic pants. When my first daughter was in the disposables she would get this horrible rash all the time, and eventually it started working it's way up her stomach and on to her chest. As it turns out she was allergic to the disposables, and when she was about 16 months old we found out I was pregnant again, so I started to do the research into cloth. She was officially into cloth about 3 months before her 2nd birthday, and her baby sister was born being exclusively cloth diapered. What were your friends and family's reaction when seeing the "new" cloth diapers and have they been supportive or skeptical of your choice to use cloth diapers? When my family saw the modern cloth diapers they were amazed, and they thought it was wonderful. Before they saw them though, they thought I was a little crazy. Most of my friends on the other hand just think I am crazy anyway because they don't have kids. What was your very first cloth diaper? It was a bumkins cover with Gerber 6-ply prefolds. I didn't really like either of them, so I got KaWaii Baby covers and some Dappi extra-absorbent prefolds instead. They worked for a while, but I wanted something more simple so I went and bought the KaWaii Baby pockets because I don't have a whole ton of money. 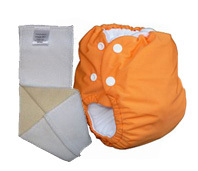 What type of diapers does your stash primarily consist of; pockets, aio, onesize, prefolds, flats, hybrids, etc.? My stash still mainly consists of the prefolds, but I try to avoid using them because I like my pocket diapers better. I do diaper laundry every day just so my pocket diapers are always clean. What is your favorite Knickernappies product or which Knickernappies product are you dying to try and why? I am dying to try one of the pocket diapers, because my 2 year old would have a hard time getting the side snaps open. I have been trying everything in my power to win one, but it just hasn't worked as of yet. In the mean time, I have been reviewing other products on my blog, like right now I am writing a review on some products for some detergent and baby moisturizer. Do you have a favorite place to hang out and talk or learn about cloth ; a blog, message board, facebook page, etc.? I use Twitter. Twitter is like a drug, you can't stop using it. What cloth diapering item, besides diapers, do you consider to be a must-have accessory? That would be a large wet bag. When you are out with 2 kids in diapers, this is a must. If you could share just one tip with someone who is just starting out with cloth or considering using cloth, what would be your best piece of advice to them? Don't write off the cheaper diapers just because you think a lower cost means they are crap. My first cover was $16.50 and it was crap, and my cheaper ones are amazing. Also, not every diaper is good for every baby and when you find something that works, stick with it. I have tuned 25 since I submitted this, and added 2 AppleCheeks, a Motherease fitted and Happy Heinys OS cover to the collection by reviewing and a contest. I <3 Cloth.